Buy Natures Aid Starflower Oil 500mg - 90 softgels in the UK from our online shop or directly from our independent Scottish store. Starflower Oil (borage oil) is a rich natural source of Gamma Linolenic Acid (GLA) and contains more than twice the level of GLA found in Evening Primrose Oil. Starflower Oil (borage oil) is a rich natural source of Gamma Linolenic Acid (GLA) and contains more than twice the level of GLA found in Evening Primrose Oil. GLA is important in helping to maintain the hormone balance which regulates and controls important bodily functions including the menstrual cycle. many women like to take this supplement around the time of their period. Take 1 softgel per day. Do not exceed the recommended intake. As official Natures Aid stockist, we sell genuine Fatty Acids & Omega directly from our shop in Scotland and online throughout the UK. Where can you buy real Starflower Oil 500mg 90's safely online? 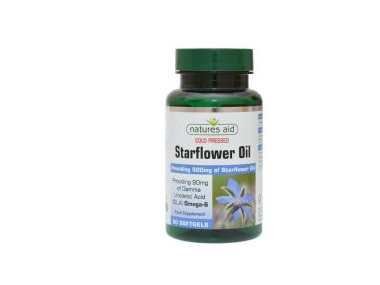 If you are wondering where you can buy Natures Aid Starflower Oil 500mg - 90 softgels safely online in the UK, then shop with us. We are an actual health foods shop; with real people selling real foods and products. Our award-winning independent shop is located in Stirling, Scotland since 1976. You can buy our Natures Aid nutritional supplements and other genuine Fatty Acids & Omega in store or safely place an order with us online or over the phone. Starflower Oil 500mg 90's - Natures Aid Starflower Oil 500mg - 90 softgels in Fatty Acids & Omega and Herbal Remedies, Tinctures & Supplements.